1/16 German Metal Ammunition Belt Sacks for MG 34/40 Discounts Apply ! 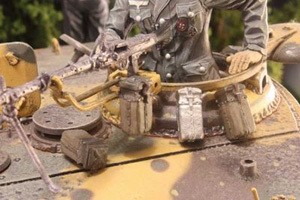 1/16 German Metal Ammunition Belt Sacks for MG 34/40 150 rounds. All German tanks with MG 34/42 carried on 30 to 50 ammo-belt bags depending on tank type. Add that extra detail to your 1/16 model or RC tank with these very detailed metal parts. Each piece can be painted and weathered. 1 per kit.